Smallwares Restaurant June Portland Dining Month Giveaway for TWO! GIVEAWAY OVER, JOHN T. WON! Congratulations! YAY! We have a giveaway just for you Portland area! I am so excited that I may over use the exclamation point in this post. I warned you… Smallwares! I am excited to be celebrating a two year blog anniversary with you, my readers. I am grateful for you, without you, there is no blog. I am in the process of sharing some awesome thank you giveaways for this month, so bare with me, there will be a thank you post coming just for you! This is the first giveaway, but the rest will be for everyone! The Portland Food Bloggers and I recently visited Smallwares for our monthly meet up. We had an awesome night, with great service and wonderful food. We enjoyed small plates and shared ten so we could each taste the creations from this amazing chef, Johanna Ware. 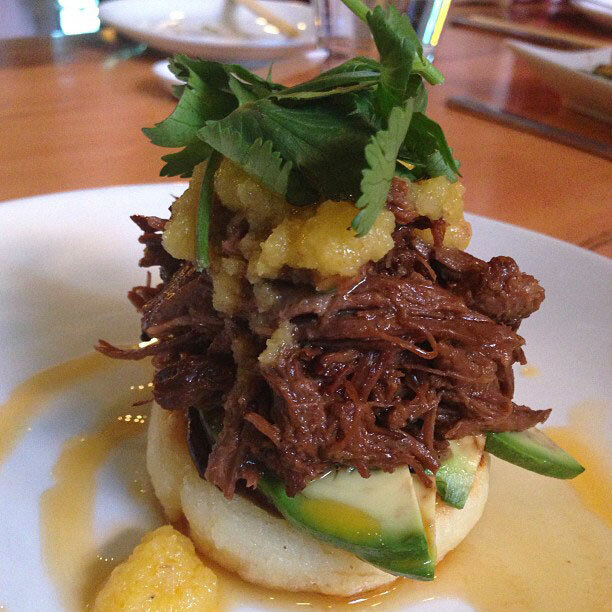 The photo above was taken by me and my Iphone, it was my favorite dish of the night, short ribs, corn cake, avocado, hoisin, smoked mango jam. It got so much feedback on all of social my media pages, everyone wanted to eat it! This is a wonderful opportunity to taste several restaurants, many dishes, at a good price. But for you today, my peoples, TWO SEATS at Smallwares will be given away, as a thank you to my local readers. 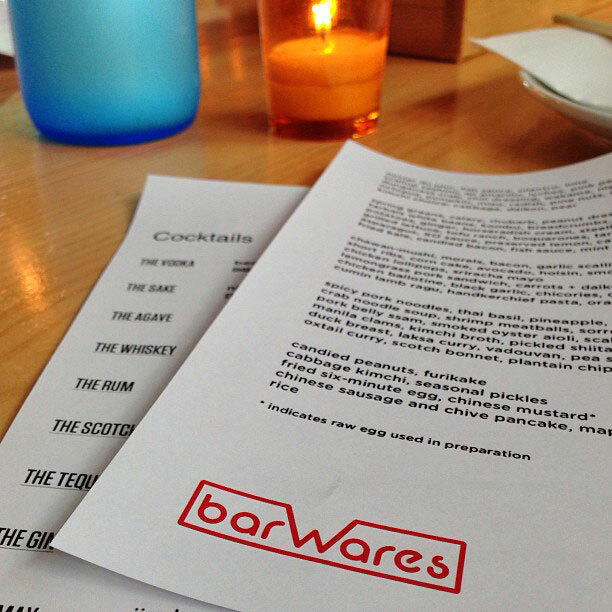 This giveaway includes two dining month seats at Smallwares for the value of $58. You will enjoy the menu seen above. All gratuity, beverages, and others dishes ordered will be the winners responsibility. Which is deal! TO ENTER THE GIVEAWAY: You must live in the Portland area, or be able to dine at Smallwares in the month of June ONLY, to enter this giveaway. 2. “Like” my Facebook Page, AND leave me a comment below letting me know you did. If you already “like” it, let me know in the comments below. If you do not do BOTH, you will not be entered. If you do not have a Facebook page, let me know, and sign up in the top right side of this page, for email updates from Not Just Baked. I was not paid to do this giveaway. Johanna Ware was kind enough to provide me with this gift certificate. All opinions of Smallwares are my own, and I love it there. I will email the winner, picked at random and announced this Saturday June 15 at 5pm. Your email is only for my use, I will never ever share it with anyone EVER. I’ve long since followed and liked and whatever the hell else your FB page PLUS I have the blog in my (admittedly slow and clunky) blog reader. I love that Portland is becoming a food mecca and that we have the bloggers to back it up. Yourself, OF COURSE, included. LOL! Um hello! You already have my thumbs up on FB, Fabi. And I’m dying to try that cured salmon. All the best thing are on one plate: salmon, tahini, pickled beets, basil! You are the cutest! I totally agree. Yum. Mmmm hangar steak with the spiciness of kimchee puree and the funk of blue cheese and acid of sherry vinegar sounds like heaven. Just liked your FB, and wishing you a happy blog birthday while also crossing my fingers for this giveaway! Yay! I’m a huge sucker for miso soup–especially with bacon dashi! Page loved! Fingers crossed! Thanks for the great opportunity! Happy Blog Birthday! Yay! Me too. Thank You! I would love to try that hanger steak, and I love kimchi but never thought of it puréed ! Sounds amazing! I also liked your FB page. Thanks for your generosity in giving such a meal away. That’s awesome!! Seriously on the puréed kimchi. And thank you! Good luck! The miso soup sounds lovely! And, I’m a fan via Facebook! Mmmm cured salmon all the way. I look forward to eating it. 😉 (I already liked your Facebook page too.) Thanks for the giveaway and happy blog-anniversary. Liked the facebook! I must have the salmon. Give me salmon or give me peace! I would love to try the lamb ragu. I love ragu. I have driven past this place quite a few times and I always think we need to stop. I also love Portland Dining month. I also liked your facebook page. The cured salmon with pickled beets sounds amazing! Smallwares is in my neighborhood, but haven’t had a chance to check it out yet! I liked you on facebook as well! I know it sounds boring but I’m a big fan of miso, so I would be excited to try that dish! I already “Like” your Facebook page too! Not at all, I love miso. It’s comforting. hanger steak + i liked your page. I’ve been wanting to check this place out for awhile. thanks! The cured salmon! I have a deep and unabiding affection for salmon, tanini, beets, and basil and I have never experienced these flavors combined. Sounds right up my alley. Me too! Make sure to Like my Facebook page to be entered. Thank you for stopping by! Just answer the question above and “like” my Facebook page and you could win! Awesome, thanks for stopping by, and good luck!